MOST of our giant oil refineries have glass skeletons in their closets. Before they spill one drop of gasoline, lubricants or other by-products of crude into the pipe lines or the stomachs of water, rail and highway tankers, their efficiency at squeezing out every cubic centimeter of value has been planned and proved in glass models sitting atop stone tables in engineering laboratories. Actual creators of these refineries are the glass constructionists who fashion the prototypes. Typical of scientific glass blowers are three men in the laboratory of the M. W, Kellogg Company plant in Jersey City, N. J.â€”master glass constructionist T. A. Graf, and his staff of two, Robert Connelly and James Margiotta. These three apply their craftsmanship and knowledge to creating increasingly improved methods of processing crude oil. The diminishing oil reserves and the changing nature of these resources make the work of the glass technicians of world economic significance. Kellogg’s is an engineering construction firm specializing in perfecting refinery methods to meet the ever-arising problems of individual companies and newly discovered oil fields. Its laboratories and shops in Jersey City provide all the services required by the oil industry. One example of the projects designed and constructed by Kellogg’s is the famous catalytic cracking plant at Aruba, in the Netherlands West Indies. The Aruba “cat-cracker” played a historic part in supplying the Allied needs for all types of petroleum fuel in World War II, and is still producing in heavy quantities. To do the creative and precision work required at Kellogg’s, glass constructionists need a variety of talents approaching those of the many-sided Leonardo da Vinci. They must not only be able to turn glass Into the most intricate and exact shapes; they must be practical physicists, chemists and engineers as well. As often as not, glass blowers fashion working glass models for new petroleum processes without benefit of blueprints of sketches. In such cases, an engineer explains the problem to be met, and how he thinks the desired ends may be attained. Then the glass constructionists go to work. They blow the parts they figure are needed for the type of unit that will be most efficient in handling the particular kind of product they want to process. Not always, however, do the glass workers design the apparatus for new processes “out of their heads.” On some jobs they work from engineering drawings. But even then they must have a knowledge of all phases of the oil-refining fieldâ€”of furnaces, reactors, regenerators, fractionators, and so on. When all the glass parts needed have been turned, they are assembled into a model of the unit the glass craftsmen and the engineers had in, mind. Then actual tests, using the crude oil to be tested, are run through the assembled laboratory unit. These glass mockups are not fashioned to scale, but they do handle the ingredients to be processed in their real proportions. Once the models are operating as the engineers believe they should, they are copied in metal in a pilot plant. Then, through the pilot plant, larger amounts of petroleum are tested. Engineers watch the tests and make improvements and, finally, when the pilot works at utmost efficiency, it becomes the model from which Kellogg’s will build commercial plants in the areas where they are needed. This method, combining theory and experiment, has revolutionized oil refining in the last 10 years. Besides saying millions of dollars in petroleum products that might otherwise have been dissipated, the models and the pilot plants have supplied valuable data for the oil industry. physics. After that he had to serve a two-year “internship” with one company. When a course like his was finished, a European glass blower was considered about ready to earn his salt in the scientific field. If he wanted to go into the commercial field, however, he could make fair money as a blower of knickknacks. It’s easier in the United States, because there is no set period of apprenticeship. 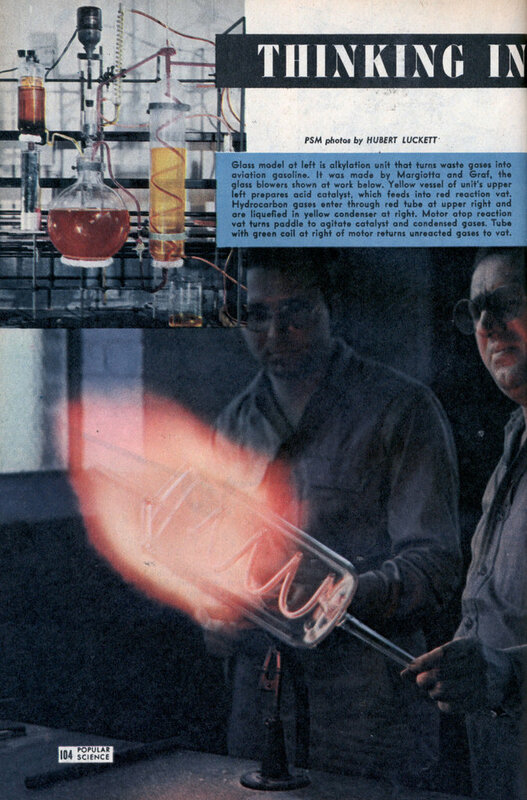 Most American-developed glass turners learn their profession, as young Margiotta did, in laboratories such as Kellogg’s, under masters such as Graf. Connelly is a graduate of a third school of glass blowingâ€”the family. Orphaned as a child, he was taken into the home of an uncle, a glass blower, who started Connelly’s tutelage at the age of 12. 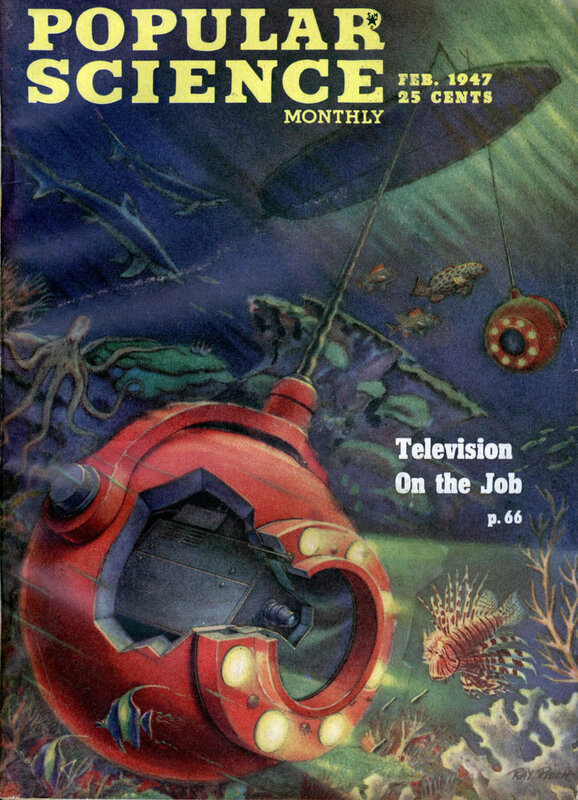 Before joining Kellogg’s staff, Connelly did precision fabricating for RCA. Margiotta is getting his scientific background at Columbia University at night, studying for a B.S. degree. As a GI, he supervised a large glass-blowing staff at the Oak Ridge atomic project during the war. Incidentally, long before the Oak Ridge plant was functioning, glass blowers had fashioned models of the apparatus that was to open so large a door to the future. In addition to a rigorous education and wide knowledge, a glass constructionist must have the right physiqueâ€”true eye and a sure hand for delicate work, and stout muscles for turning out cumbersome glass units that often weigh many pounds. To appreciate the muscles and stamina needed in the working of glass, it must be remembered that once a job is “in the fire” there can be no letup in the turning, pulling, twisting and blowing until the piece is finishedâ€”even if it takes 10 hours. A few seconds out of the fire can ruin a painstaking, costly job. And the right temperament is also necessary, for they do work that would sap the patience of an engraver on the heads of pins. A true eye is as essential to an engineering laboratory glass worker as exact pitch is to a concert singer. Much of the work at Kellogg’s precludes the use of measuring aids. The spiral in a glass coil or an elbow of tubing cannot be measured while the worker keeps weaving it in and out of his flame. The eye carries the entire responsibility. To split a hair, the class of work done by Kellogg’s staff is not properly called glass blowing. Rather, it is glass constructingâ€” or fashioning. Only occasionally is it necessary for the technicians to puff into a glass or rubber tube. Mostly they turn, pull and twist their mediums into shape. Judging from past performances, even more intricate glass skeletons for greater, more economical petroleum and chemical refineries of the future are certain to come out of the heads and the flames of the laboratory glass technicians.